This adorable girl is Ebony. She's a 1 year Labrador Retriever mix. Ebony still has lots of puppy energy and is looking for a best friend who can work with her obedience training. Hey, I'm Ebony! I was transferred to Wayside Waifs when my last shelter ran out of space for me. It's okay, though! I've been having so much fun with my fellow Waifs, and I know my family will be here for me any day now. I'll do great in a home with children or other furry friends, but I'd like to meet them before heading home to get an idea of how we all get along. I'm a 47-pound ball of energy, so staying active is important! 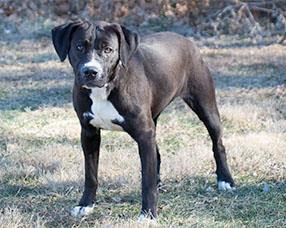 I'll do best in an active home where I'll get plenty of play time. I love to get out on walks and explore the world, but I'll benefit from using a harness so I can learn to stick right by your side instead of pulling ahead. I'll need some basic obedience training so I can learn exactly what you expect from me, but I'll learn the ropes in no time! I already know the command Sit, and I'm eager to learn even more, especially when I'm motivated by praise or yummy treats! 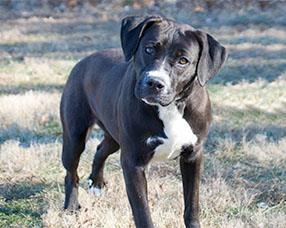 I'm a goofy, playful girl looking for a family to give all my love to. If you think that might be you, please stop by and say hi! 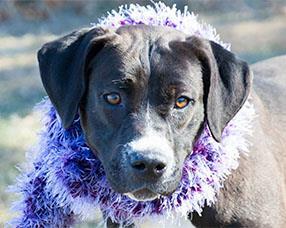 Ebony's adoption ID number is 30544224. She looks like a sweetheart! Sharing her and hoping she gets a forever home soon.